Someone famously said "An un-examined life is not worth living". Well, I don't actually believe that, but I do believe that sometimes it is good to look at your life and think about what it is you want to do, you want to accomplish, maybe even how you would like to be remembered long after you are gone. One of the exercises in a creative writing class was to write ones own obituary. As a 20 something, I really hadn't a clue. But it was a good exercise in that it forced me to think about how others might perceive me compared to how I perceived myself. As the earth pivots in it's orbit around the sun and the northern hemisphere begins its steady march toward longer days and shorter nights, the feeling that life gone quiet will soon be returning, the winter solstice and beginning of the new calendar year is a good time for contemplation. So. Who do I think I am? I think I know quite a lot about the creation of textiles. I think I'm pretty good at explaining the nuances of the creation of textiles. I think I am encouraging of people who want to know more about the creation of textiles. I think that being a creative person makes me happier, healthier, than if I didn't have something creative to put my attention on, to focus on. I have doing this for a rather long time now. I have been involved in internet interest groups since 1994. I have watched as people struggled to learn the craft, quite often on their own, with nothing but books, then You Tube videos to point them in a direction. I have tried to assist people with understanding why their efforts may not have turned out quite the way they expected, simply because they didn't know any better. That they chose inappropriate materials. Equipment. Processes. My intention in this has never been to put them down but to help them understand. Most people have been very open to my suggestions, but a small fraction have not. I have learned to not give advice willy-nilly to everyone having issues. Because sometimes they just don't want to know. I even had someone email me to question my motives in doing what I was doing, inferring that I was selfish and greedy because I wanted payment for a particular event I was organizing. In the end I found myself unable to respond to the email and let it go unanswered. She had obviously made up her mind about me and would not be swayed by any explanation or justification I might proffer for expecting a (small) remuneration for my time and knowledge. Even though these interactions are the minority of the feedback I have received over the years, they have stung sufficiently that I am now extremely careful about who I offer free advice to. Because you know how valuable advice is by how much you pay for it. 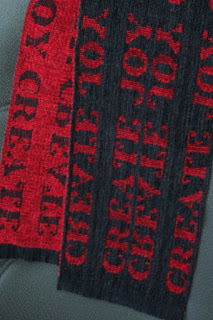 I have withdrawn from most of the social media type groups I have, at one time or another, belonged to because my heart actually aches when I see people post their intentions, using yarn that is going to cause them grief, processes that are not going to give them good results, using equipment that isn't the best. All I can do is watch the disaster and heartache unfold. And I can't. So I exit stage left - and leave them to their struggles. I have learned that not everyone is open to any kind of unsolicited suggestion. And so I keep my opinions pretty much to myself these days unless someone directly asks for my input. Except here. This is my blog, my opinions. Anyone coming here is here because they choose to be here. If they don't agree with me, there are plenty of other places to go. Maybe too many. How do you know who to listen to? I'm fighting with fatigue these days and the short, grey, dreary days are not helping. I am finding satisfaction in working with colour, which adds a certain zest to the studio. I didn't start out feeling comfortable working with colour. Truth be told, I'm still not all that comfortable now, although after a concerted effort to understand how colour works, theoretically, then within the woven structure, I am a lot braver, a lot bolder than I used to be. Not everyone is instinctively comfortable working with colour. To those people I have suggested to begin by weaving colour gamps. First the primary colours, then the tints/tones, pastels. Really look at how the colours are in their undiluted state, then how they look when they cross each other. Train the eye to see differences. I find that years of making jigsaw puzzles has helped with that, and to learn to see fine detail. Both good things to be able to do when a weaver. But for those who would like a more structured approach to learning about colour and textiles, Tien Chiu is developing on line classes in colour and design. She has been working hard on getting her first class ready for the new year. If you, like me, are not comfortable working with colour, this might be a nice way to jump in and get your creative toes wet. As for the fatigue? It, too, is a matter of just jumping in and getting moving. Fatigue is not cured by resting or naps. It is just a constant companion, a veil that needs to be shoved aside so that I can carry on with what I really want to do. If I sit for too long it just gets harder and harder to get moving again. So now I give Fatigue a nod, tell it I see it for what it is, but I'm going to get up out of this chair and go weave anyway. Because while nothing much makes Fatigue 'better', nothing much makes it 'worse'. It just is. Recently someone asked me when I was going to retire. I told them I am already doing what I love, why would I retire? The fact is, though, that I am seeing the effects of a lifetime of labour. No body resists repetitive motions done pretty much every day forever. So once again, with the coming of the new year, I am thinking hard about what it is I want to accomplish in my life. This time last year I was either at mom’s apartment or at hospice. There was plenty of time to think as I sorted through her things. Keep? Give to family? Donate to charity? Toss? This year has been a year of reflection. What do I want to do? Answers were not forthcoming so I resorted to the easy. The comfortable. With one goal only-to try and address my excessive stash. In that effort I claim limited success. Limited, because I definitely have way too much stash. A classic example of SABLE...Stash Acquired Beyond Life Expectancy. So, after much thought I still have not come to much in the way of a plan. I have decided to continue with the effort to publish the manuscript, in some sort of format. I am still exploring possibilities but realized I needed a professional to help and have hired someone who has the appropriate knowledge. I will meet with her next month in hopes of settling questions that I can’t answer on my own. 2018 is already shaping up to be busy as we enter into the nitty gritty of conference planning. Some things are well underway, some things need to be addressed in the next few weeks...as soon as the holiday is done. As for me, every day is a potential work/Weaving day. So today I thread the loom and keep on, keeping on. People don't understand why staying within the sweet spot is important. I am currently weaving on a Baby Wolf which is a small floor loom with short distance between breast and back beam. 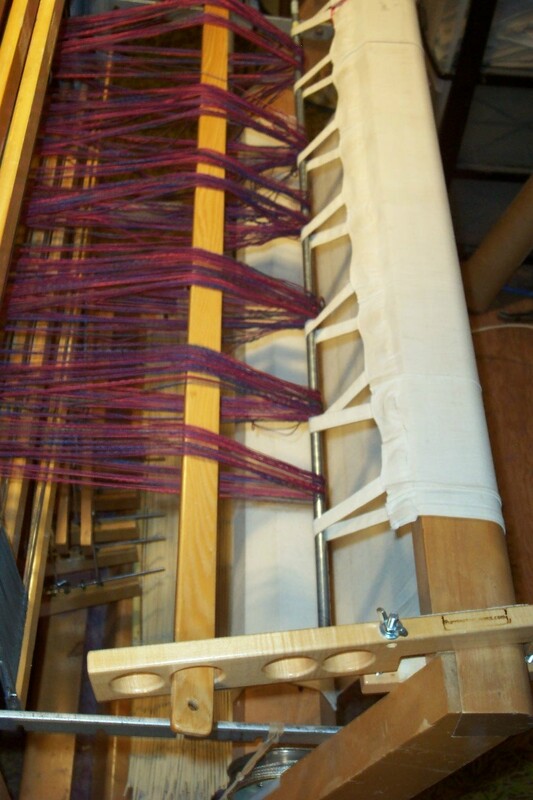 It is a jack loom so the shed is formed by the shafts rising. At the beginning of the sweet spot, the angle the threads are forming is about 20 degrees and the bottom of the shed floor is pretty much on the shuttle race. The shed is nice and clear and large. Plenty of room for the shuttle to pass through. While the shed is still big enough for the shuttle to pass through, it is clear that the bottom of the shed has lifted significantly from the shuttle race and the threads are under more stress because of the more acute angle at which they are opening. If I pushed beyond this point, the shed would become harder to open (require more foot pounds) and it would also become smaller. The bottom of the shed would continue to lift away from the shuttle race making it more likely that the shuttle would 'submarine' and pick up threads from the shed floor. By pushing beyond the sweet spot, there is more likelihood that threads would break, especially the selvedge ends, which are under more stress than the rest of the warp to begin with. Another thing that happens is that the warp tightens ever so slightly as the warp ends take up more and more. 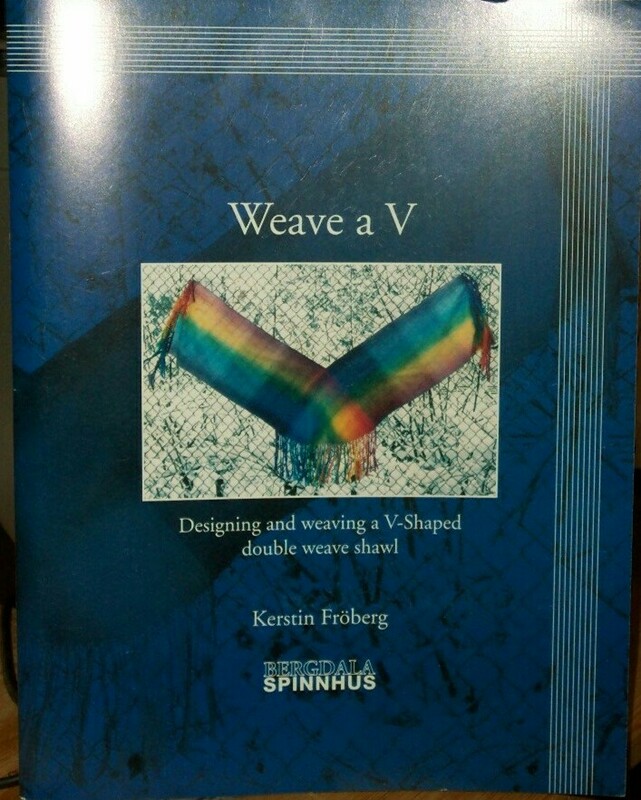 The force needed to beat the weft in will change with the tightening of the warp. 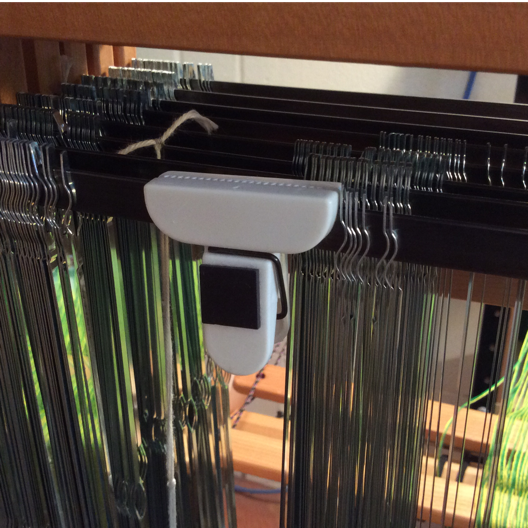 As the beat changes, there can be streaks in the cloth as the warp is pushed to it's limit, then released and rolled forward. Much, much better to stay within the sweet spot and advance more frequently. Today is the winter solstice in the northern hemisphere. Here today it is dull, grey, depressing. It is also the one year 'anniversary' (if you will) of mom going into hospital, then hospice. It is a day to pause, reflect. Taking stock. Goal setting. The new year begins with the returning of the light. And so I have been dealing with a lot of things, emotional, physical, professional. My entire life I have believed that encouraging others takes nothing away from me. My approach to weaving is to encourage, inform (to the best of my ability) and - hopefully - light up someone else with the joy and delight I take in creating textiles. Many things got put on hold this year. I am hoping to return to some of them. Some may get discarded. Most people my age are 'retired' but how can I 'retire' to do what I love when I am already doing that? But I am also tired. So I am looking at how much time I have in relation to how much energy, and am making choices. I don't make resolutions for the new year. Instead I focus on what is important to me. I made goals. I set (arbitrary) deadlines for myself. There is no point, for me, to have goals if I don't also have a finish date to work towards. So today, as the earth completes another journey around the sun, I encourage everyone to pause, take a deep breath, focus on what is important and work steadily towards the good and positive in their lives. Maybe even light a few candles. Because we can all use all the light we can get. This draft has a repeat of 20 ends made up of four groups of five. To keep track, I tie each group of five into a slip knot, then when all four groups are threaded I tie them all into a bundle. That way I know all four groups have been threaded and I can start the next repeat. Some people use different methods to keep track. Every person has to figure out what works best for them because we process information differently. What works for one may not work for another. Conferences. 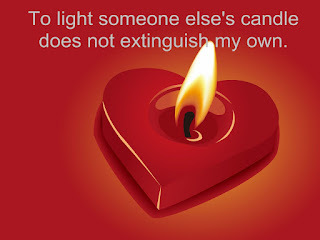 Love them or not, a lot of people are involved in the planning and execution of them. Conferences - no matter the topic - are fraught with details. Lots and lots of details. It is the managing of those details that make the experience good - or not - for the instructor, the participants and the planners. So this week I have spent another several hours, combing through submissions, making sure I have good topics, trying to sort out the details revolving around those topics, then sending emails off to the instructors to review (and revise/correct/add). All of this sorting out of details is done by the planners as volunteers (as in not paid) and for the instructors as part of the administrivia that goes into setting up an event (hopefully covered in some part by the fee they will receive as part of the event). So when people wonder why I am being more generous to instructors in the budget than some previous conferences, it is because I have been an instructor and I know how much work goes into crafting the topic in the first place, then all the myriad details that take up time - maybe 20 minutes here, 40 minutes there, a couple of days once the event is given the go-ahead. All long before the instructor will be paid for their efforts. Even when they do get paid, I can attest that many times they are working for 'free' to insure that the event goes as smoothly as possible. There will always be glitches. Flights are delayed. Suitcases get lost. Vehicles break down. Equipment either breaks - or was forgotten. Most participants are not privy to these things because usually the instructor just makes do and/or the planners scramble behind the scenes to get things sorted. I agreed because conferences are great meeting grounds for fibre artists to gather, in real life. We get to actually touch each others textiles, not just see a picture. We get to share ideas. We get to know each other better. We get to exchange knowledge and information. We get to thank those who have inspired us, even at a distance. We get to see exhibits. We get to shop! And not from a sample card, from from actual vendors selling things right into our hot little hands. We get to have conversations. By the end of the conference friends may have been made, which can continue via the internet (rather than the snail mail that we had previous to the internet). Connections will have been made. Minds may have been opened to new ideas, new concepts. Horizons may have been broadened. Knowledge expanded. No one gets to be my age without making some mistakes, having some regrets. And yes, I have. Mostly those mistakes were errors in judgement - how much I was actually capable of accomplishing. Hanging onto something that wasn't working for too long. Some of these errors wound up causing me grief, in one way or another. No one enjoys making mistakes. But we do. It is how we deal with the results of our mistakes that make them valuable. As in the "Well, I won't do that again" if nothing else. But that is how we learn. That is how we gain knowledge. Even, at times, wisdom. Some mistakes have much larger consequences than others. Some carry more grief. But there is always a lesson to be learned. Students sometimes get so focused on the mistakes that they neglect to see the lesson. My job as a teacher, I feel, is not to point out the mistakes but to help them come to see the lessons. 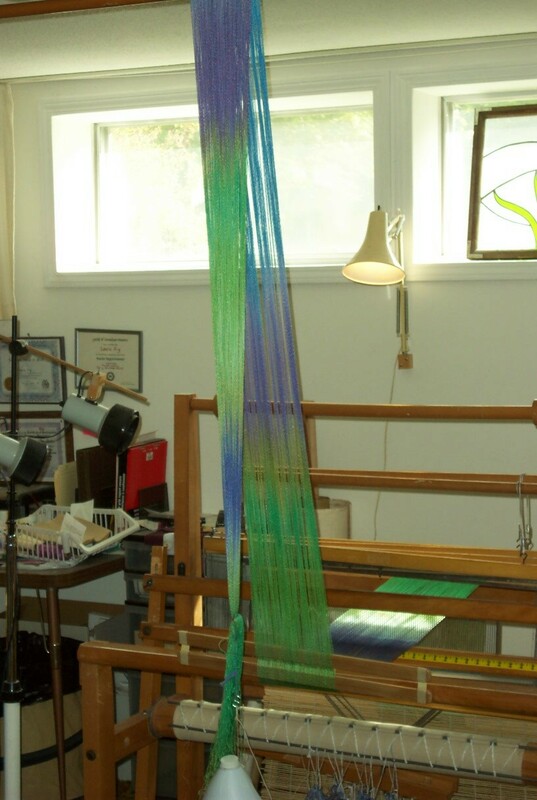 Teaching a workshop is a great deal different than teaching the Olds master weaving program. The goal is different. Teaching a workshop is an encapsulated very focused look at a particular aspect of weaving (usually). The Olds program is meant to help students see the lesson. Mistakes will be made. Disappointments will happen. Knowledge will increase if the student analyses what they have done so they learn from what they have done. How has this warp not met expectations? What needs to change to make it align more with the intent? 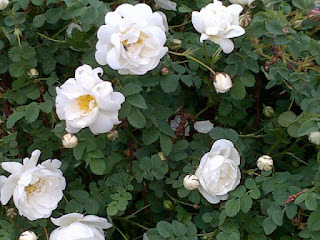 Rose bushes with beautiful white blossoms also have thorns. When we stop to smell the roses, we need to appreciate the blossoms and avoid the thorns. And we need to get past our regrets, our mistakes. Absorb the lesson. As one of my mentors would say - if you aren't making mistakes, you aren't learning anything new. I'm always looking for ways to make things easier, simpler, efficient. 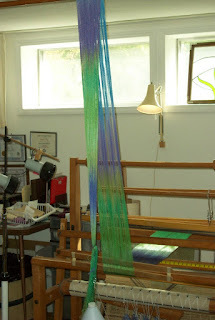 Today I was threading a warp on 8 shafts - two blocks of twill, 40 ends per block. Too many ends to easily see if I'd done enough - too little? too many? Counting out the groups of four to make sure I had 10 of them was taking time and annoying me. After thinking about it for a few minutes I grabbed this little clip, counted out 10 heddles on shaft one (for block A) and proceeded to thread the four end repeat on shafts 1-4 until all 10 of the heddles on shaft 1 were used up. Then I shoved all the heddles from the first four shafts to the left, counted out 10 heddles on shaft 5 and threaded the twill progression until those 10 heddles were used up. I also tie each group of four into a slip knot, then tie the 10 groups of 4 into a larger slip knot, just so I can keep an eye on my progress - and make sure I alternate between the two sets of shafts. Once I started doing this threading felt like it was going faster, but mostly I wasn't getting annoyed at having to repeatedly count out groups of four. And peace of mind is a wonderful thing. Endings. Beginnings. Everything must begin before it can end. But endings mean beginnings, too. Sometimes endings mean a new direction. Sometimes endings are just a pause, an Interlude before one continues onwards, on the same path, in the same direction. Or changes direction completely. When it comes to Fibres and yarns there are constant endings and beginnings. Fibre packages run out and new ones begun. Projects are finished, new ones started. 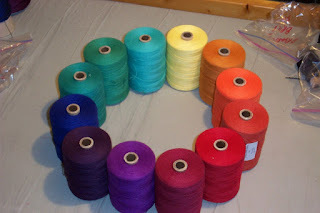 Bobbins may need several rolags in order to be filled with spun yarn. A woven textile may require many bobbins in order to be woven. These endings - and beginnings - are not to be faced with dread but calm acceptance than everything ends. But then? Beginning again.